Oscar Wilde's mermaid story was written in response to Hans Christian Andersen's "The Little Mermaid". Andersen's mermaid story is strongly Christian in it's outlook and philosophy, while Wilde's is delightfully pagan. In Andersen's mermaid story the mermaid longs for a soul so she may marry a human. Here a fisherman longs to rid himself of his soul for the love of a mermaid. A young fisherman fell in love with a mermaid and wanted to join her in her land beneath the sea. The mermaid told him he could not be with her because he had a soul and she did not. The fisherman swore to get rid of his soul for the mermaid's love. He visited a young witch who lived in the mountains. She gave him a magic knife and told him to stand with the moon behind him and use it to cut the soul from his feet. She said, "The shadow of the body is the body of the soul." As the fisherman cut the soul from his feet the soul begged him not to separate them. When the fisherman refused the soul asked that he also cut out his heart and give it to the soul. "With what should I love my love if I gave thee my heart? " the fisherman asked. When he was free from his soul the fisherman left to join his mermaid under the sea. The soul, before he departed, told the fisherman that he would return after a year and call to him. The soul returned the next year and the year after that. Each time he offered the fisherman some marvelous treasure he had found in exchange for joining with him again. Each time the fisherman told him "love is greater." The third year the soul offered to take the fisherman to a maiden who danced beautifully with naked feet. The fisherman remembered that the mermaid had no feet and could not dance. He agreed to join again with his soul provided that he could return within a day to his little mermaid. The soul, however, had tricked the fisherman. There was no dancing girl with naked feet. The fisherman, when he realized this, tried to cut his soul from his feet with the magic knife but it did not work. The soul said that a man may separate his body from his soul only once in his life, never twice. The soul had rejoined the body of the fisherman, but he could not enter his heart because it was too full of love for the mermaid. The fisherman mourned his lost mermaid for years. One day her dead body washed up on the shore, and the tritons of the sea came to kill the fisherman for deserting her. Just before he died his heart broke and the soul entered it. Finally, they were truly one. 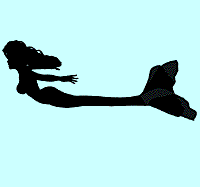 The entire mermaid story can be read at the Classic Reader website. I strongly recommend that you do so since the story is full of so many beautiful things that I cannot include here. Click here for a synopsis of Andersen's mermaid story.